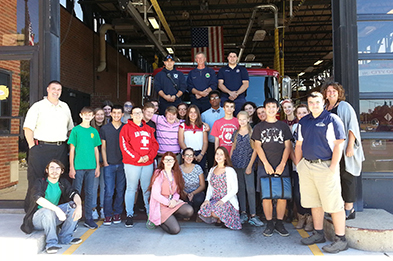 Tech Valley High School Art and Design students and teacher Jennifer Muirhead pose with Albany Fire Department firefighters in front of the Pinebush Station. Albany Fire Department Battalion Chief Geo Henderson has called on Tech Valley High School students to design a new patch for the Pinebush Station and Engine 4. Students in teacher Jennifer Muirhead’s Art and Design classes will work in partnership with artist Michael Conlin to create potential designs using computer software, and the final version will be picked by a panel of firefighters and Albany Mayor Kathy Sheehan at an event on Oct. 31. Henderson visited TVHS on Wednesday, Sept. 14 to roll out the project. He explained that Engine 4 serves the SUNY Albany and SUNY Polytechnic Institute campuses, and the Pinebush area of the city of Albany. When the station was first established in 1974, however, the area was largely undeveloped, so Henderson said it’s time to update the patch to reflect a new brand for the station. Henderson said he was captain of Engine 4 for the past year and a half, and had anticipated ending his career there, but was recently promoted to battalion chief. He said it was important for him to continue the project, however, and hopes a new patch will boost the station’s morale and reflect how it has evolved over the years. Students participated in a field trip to the Pinebush Station on Friday, Sept. 16 as part of their research and brainstorming sessions. They spoke with some members of the department to get an idea of what firehouse living is all about, and gathered background information for creating their patches. Conlin will visit the classroom in the near future to share advice and recommendations on how to brand the perfect patch for the fire department. The project will culminate in class on Monday, Oct. 31 with a contest that will be judged by a panel of firefighters and Albany Mayor Kathy Sheehan, who will choose the top three patches that best represent Engine 4. Prizes will be awarded to the top three choices of the panel.